‘I’m a freelance illustrator and have been for the past nine years. You don’t realise how much you transition, change and reset yourself in a career spanning nine years so far. All the steps you take, all the different paths and meanderings you go down with the work that you do, the people that you meet and the processes that you start to use…Travel is amazing. If you can afford to do it step out of your studio for a while. Take your sketchbook get a camera. It’s surprising how much you can benefit from just stepping away from your desk for a good period of time…Not everyone hits the ground running. I didn’t. My post uni experience was four years of floating about and going the scenic route and I quite like the scenic route. You can always go from A to B but you can also just go “what’s down that wood there” or “over that bridge there”. It’s a little bit more interesting.’ A great talk for students about to set out or those of us who already have and appreciate the reassurance of other scenic route takers. 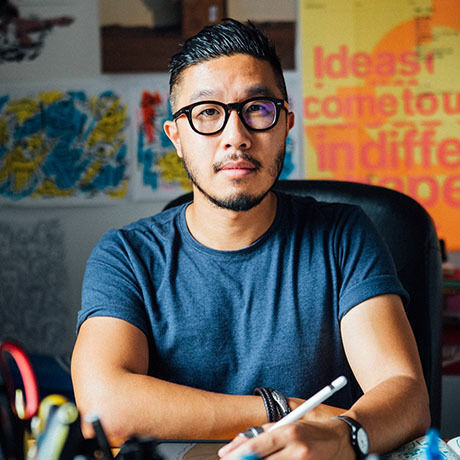 Geo Law is a freelance illustrator and doodler based in Sheffield and as jet-setter has worked on creative projects for the likes of Facebook, Kiehl’s, Microsoft, Google, The New York Times, The Washington Post, Dunkin’ Donuts and Whole Foods to name a few. Geo’s blend of artwork ranges from doodling murals onto walls with Posca paint pens to creating vibrant colourful illustrations of characters and worlds using his iPad Pro all thanks to his love of comic books, cartoons, anime, video games and hip-hop. As well as freelance work, Geo teaches part-time at Sheffield Hallam University instructing on creative modules for Graphic Design & Illustration as well as Digital Media Production. Geo also runs the Doodle Club, a monthly event held in Sheffield where he leads an after work hours drink and drawing evening where special guests are invited to run workshops and the guests take part with doodling on worksheets.